File Name: Seymour P. Fine of Geraldine, Montana. Notes: Geraldine is in the north central part of the state, about 60 miles east of Great Falls. It is a very small town, about half a square mile in area with a population of less than 300. 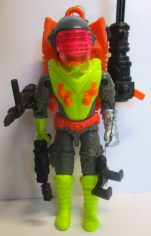 Sunbow's Sci-Fi wore his 1986 outfit in a duller color, with a white backpack and black padding on his vest. His hair was brown in Computer Complications but black in Nightmare Assault. The DiC series used his 1991 outfit with grey shoulder pockets, and the yellow stripe on the front of his shirt was usually missing. 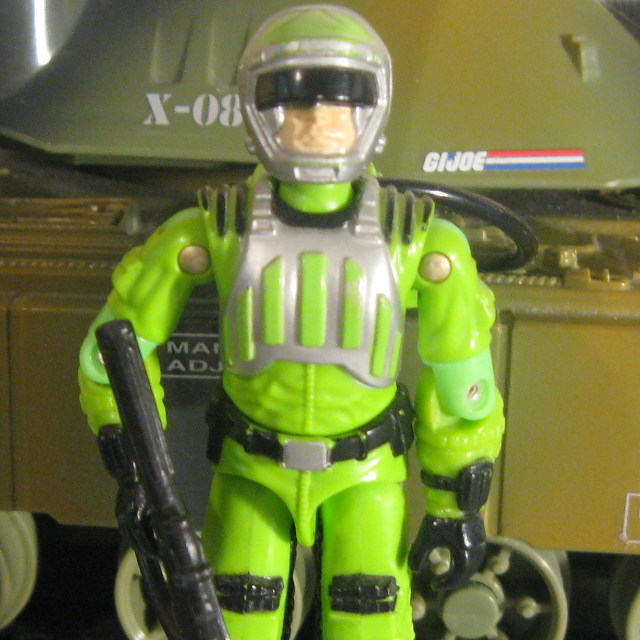 His laser rifle was white, and the air tank on his backpack was prominently colored red. Accessories: large black laser rifle with peg for hose (new), bright green wedge-shaped backpack with clips for rifle (new), long black hose (common). Sci-Fi lives in a slow-motion world. He takes everything real easy, and he's never in a hurry to get anywhere or do anything. But that's what it takes to be a laser-rifleman. At a range of 2 1/2 miles, the impact spot of laser light will jump one hundred feet for every one thousandth of an inch movement at the source. That spot has got to be held on target long enough to burn through that source, otherwise it's no more harmful than a warm breeze. "When Sci-Fi braces his weapon and sights in on a target, he becomes a rock - no discernible movement of any kind. Birds perch on top of his helmet. He transcends mere stillness to another plane of immobility. You don't even see the trigger finger move. It's like he wills that beam of light to stab the darkness. . ."
Accessories: silver laser rifle with thick body and scope (new), silver spring missile launcher with crescent-shaped padding for shoulder (new), yellow spring missile with rough, elaborate tip (new), black armored helmet with chinguard and silver eyepieces (new), silver high-tech backpack with peg on side for hose (new), medium-length black hose (common), long black hose (common). SCI-FI's fascination with electronics and high tech laser optics forced him to take a leave of absence to complete his Master's Degree in Electronic Engineering. By combining a laser weapon's remote target designator, range-finder, and an optical signaler, Sci-Fi was able to perfect an unparalleled defensive security system as part of his Master's thesis. The program has since been adopted for field testing by the Department of Defense under the designation XMLWS-2A. "Let's face it. Sci-Fi is not the kind of guy you want to go to town with. He has no sense of humor and is only interested in things with integrated circuits or complex optics. On the other hand, Sci-Fi is the guy you want with you in the field. Not only can he hit targets at extreme range with his private arsenal of laser weapons, he can put a laser dot on a squad of tanks so they can be zapped by air strikes. His ability to repair electronics equipment is invaluable when you consider everything in the unit's inventory has been built by the lowest bidder." Licensed to operate: Mobile Battle Bunker, Hammer, Avalanche. Toy Notes: Item #6587. The prototype shown in the 1991 insert catalog had a silver missile. Accessories: silver laser rifle (91 Sci-Fi's), white helmet with blue eyepieces (91 Sci-Fi's). SCI-FI's fascination with electronics and high-tech laser optics forced him to take a leave of absence to complete his Master's Degree in electrical engineering. His studies led him to combine a laser weapon's remote target designator and optical sensors to create an unparalleled security system that has since been adapted by NASA. An obvious genius with lasers and radically designed instrumentation, Sci-Fi became the first recruit to pilot a STARFIGHTER. He handles the jet's controls with confidence, even at quasar velocities exceeding the speed of light! In combat he fires laser rockets with incredible accuracy, and has turned more than a dozen COBRA INVADERS into burned-out pieces of galactic garbage. Motto: "When you're pulling an inverted G-force dive during a stellar dogfight, there's NO room for error!" Accessories: black pistol (90 Cold Front's), black spring launcher with orange trigger (94 Duke's), two black spring missiles (93 Bazooka's), silver elliptical space helmet with clear pink face shield (new), orange large square backpack with hook on bottom, black robot arm, and hole for launcher (new), black T-shaped grappling hooks on thin string (new). SCI-FI may just be the best fighter pilot in the history of space flight. Having left Earth's atmosphere more times than he can remember, Sci-Fi considers space his second home, and aims to protect that home from greed-driven tyrants like COBRA COMMANDER. 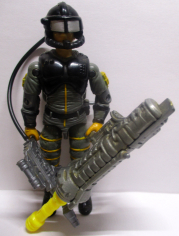 On a recent mission he let an entire squadron of COBRA BLACKSTAR pilots chase him so close to a black hole, that when he pulled an inverted G-force dive, they became caught in his jet wash and sucked into inescapable oblivion, right where they belong!